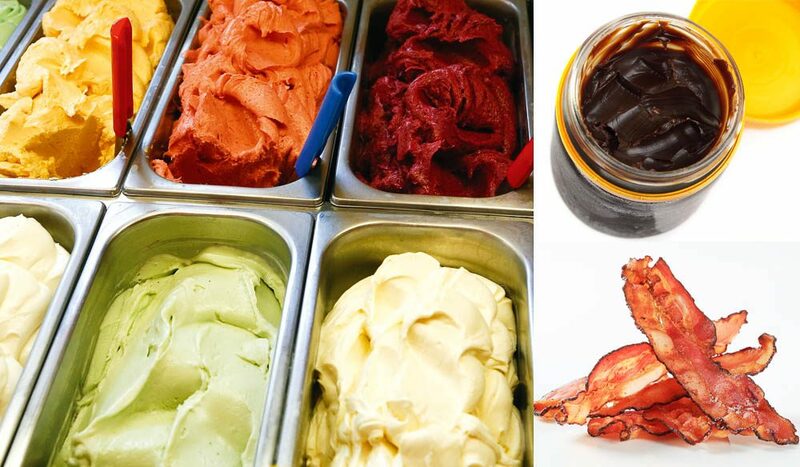 How far will your tastebuds venture into experimental gelato flavours? It doesn’t get much more Aussie than this. If you’re around Brisbane this Australia Day, visit Gelateria Cremona for a patriotic scoop of their Vegemite or Lamington-inspired gelato. But, if the jarred stuff is anything to go by, we doubt any overseas visitors will appreciate the genius behind it. Combining two summer essentials – ice-cream and fish and chips, this unlikely match is a must-try for visitors. Made with real batter at award-winning Perth gelateria, Il Gelato, this controversial flavour is available exclusively at the Freo café. We’re not sure if it’s better or worse for you than the real deal, but a scoop is said to fill your mouth with a subtle salty and smoky sensation. Infused with actual smoked bacon, it’s become a favourite at Canberra’s Fishwick Fresh Food Markets and Capital Regional Farmers Markets, where you can sample Frugii’s other experimental flavours such as gorgonzola or laksa. Combining pistachio nuts, cardamom, rosewater and saffron, this rich concoction has been likened to an Indian kulfi (a frozen eggless dessert). Break up the intense flavours with a scoop of their extra virgin olive oil sorbet. Dubbed the Obama Rama, this American sandwich-staple is served in ice-cream form, combining sweet and savoury flavours like its bready originator. Time your visit right and you can sample their famed ‘sweetcorn and caramel’ too. MORE: Plenty of tasty morsels for the foodies.